Tom Petty, Rock & Roll Star. Not a student role model. 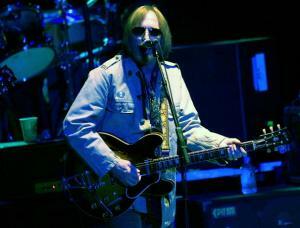 Tom Petty has made some great music, but he’s not someone to consult for educational advice. PoemHunter.com says that he’s a high school dropout. I don’t have a confirmation, but it is clear that he did not attend college. He was at the University of Florida — as a groundskeeper. Then he found his muse, moved to LA and got his first of many record deals. 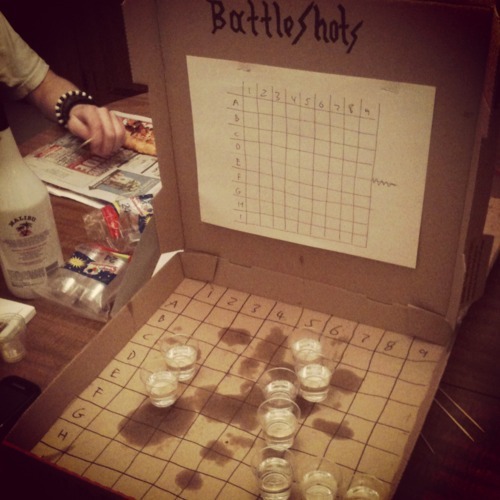 Battleshots games are most commonly made with re-used pizza boxes. I do NOT recommend playing the game with the number of shots in play shown here! Again, not someone to seek advice from about your education. However, it’s a rare student that doesn’t find a time to walk on the wild side while in college. Drinking games are a part of that, and BattleShots! has taken its place alongside Beer Pong as a go to solution for students seeking a release. 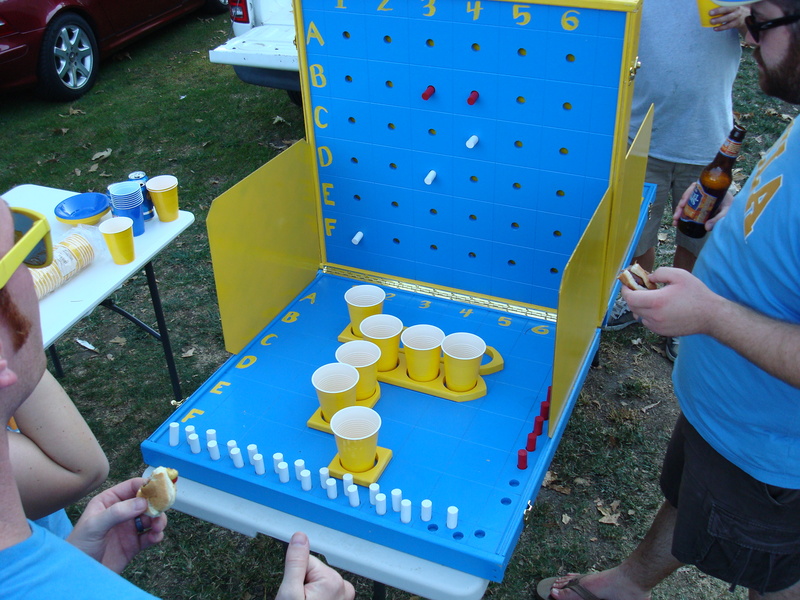 BattleShots is played like Battleship, except when one of your boats is “hit,” you drain a cup from the board. The problem, of course, is that there isn’t a great source for BattleShots! game boards. What’s the discriminating partier to do? There are online tips but those are hardly satisfactory. But when you want to do it right … and you’ve got skills and resources … you can get to a better place. Designing a better BattleShots became a class project for a graduate level engineering course at the University of Southern California. The students put their design through usage analysis, figured out the ideal sight lines, etc. Michael and I then took the project from the theoretical to the practical and built it in the garage. Enjoy the pictures. Want to see other woodworking projects I’ve done? Check out my other blog on LumberJocks.com. The yellow baffles are removable; they just sit in slots routed into the edges of the playing surface frames. The design group decided there should be boats with 10x cup positions on a grid of 36x squares. The 4 boats are sized with 4, 3, 2 and 1 positions. This was hotly debated; the alternative of having 4, 3 and 3 or 3, 3, 2 and 2 were also considered. 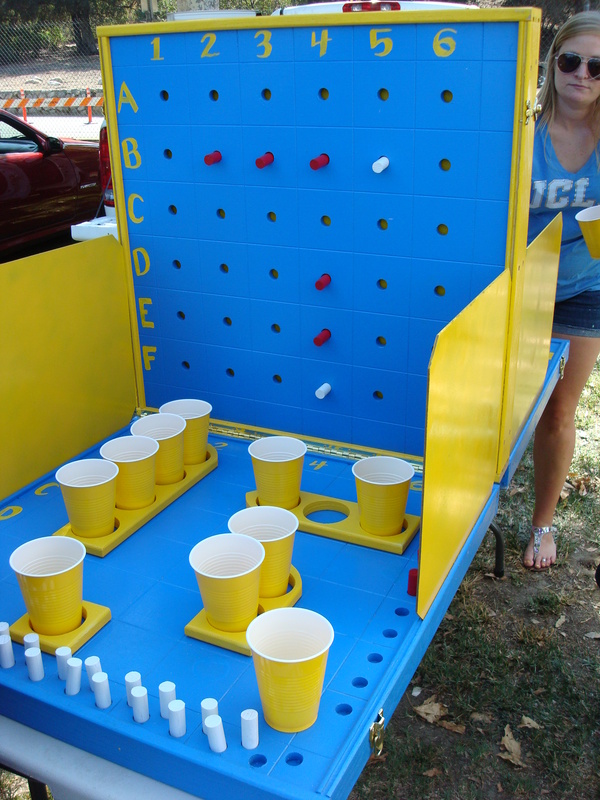 The game’s made for tailgating, and in spite of Michael currently being in the final year of getting his Master’s from USC, the game HAD to be painted in UCLA colors. Both Velda (MSN, ’02) and Michael (BS Engineering, ’09) got degrees from UCLA — and once a Bruin, always a Bruin. If you know anything about this college rivalry in Southern California, you know this was a big deal! Where can I buy one of these??? We bought most of it at Home Depot! Of course, there was some assembly required….